Tooth decay doesn't appear out of nowhere. It begins with bacteria, which produce acid that softens and erodes tooth enamel. Without adequate enamel protection, cavities can develop. So, one of our prevention goals is to decrease populations of disease-causing bacteria. One way is to deprive them of carbohydrates, a prime food source, most notably refined sugar. That's why for decades dentists have instructed patients to limit their intake of sugar, especially between meal snacks. Ironically, we're now consuming more rather than less sugar from a generation ago. The higher consumption impacts more than dental health — it's believed to be a contributing factor in many health problems, especially in children. Thirty years ago it was nearly impossible to find a child in the U.S. with type 2 diabetes: today, there are over 50,000 documented juvenile cases. Cutting back isn't easy. For one thing, we're hard-wired for sweet-tasting foods. Our ancestors trusted such foods when there was limited food safety knowledge. Most of us today still have our "sweet tooth." There's also another factor: the processed food industry. When food researchers concluded fats were a health hazard the government changed dietary guidelines. Food processors faced a problem because they used fats as a flavor enhancer. To restore flavor they began adding small amounts of sugar to foods like lunch meat, bread, tomato sauce and peanut butter. Today, three-quarters of the 600,000 available processed food items contain some form of added sugar. Although difficult given your available supermarket choices, limiting your sugar intake to the recommended 6 teaspoons a day will reduce your risk for dental and some general diseases. There are things you can do: replace processed foods with more fresh fruits and vegetables; read food labels for sugar content to make better purchasing decisions; drink water for hydration rather than soda (which can contain two-thirds of your daily recommended sugar allowance), sports drinks or juices; and exercise regularly. 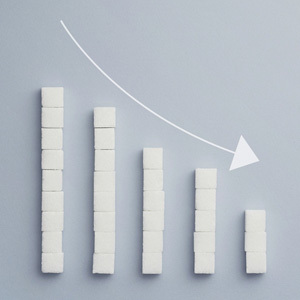 Keeping your sugar consumption under control will help you reduce the risk of tooth decay. You'll be helping your overall health too.